It all began with a week long vacation at The White House which faced the ocean and was located on the boardwalk between 110th and 109th streets in Rockaway Park. We occupied a very small room that had kitchen privileges, which meant two stoves and an icebox were to be shared by the residents occupying one of the six rooms on the second floor. Mom and Dad slept in a double bed and were separated from Claire and me by a floor-to-ceiling hanging curtain.There was a small sink in the room and a small size table and chairs.. Not only was the kitchen down the hall, but the toilet was as well. There was always a lineup for both facilities. Also available were outdoor lockers for changing and outdoor showers, complete with cold running water. Our “room” at The White House in Rockaway, 1938. Helen & Ted Hinck; Uncle Charly & Cousin Bobby Hoppe; “Aunt” Mabel, Joyce & Muriel Trotte; G’pa + G’ma Hoppe; Mom, Dad, Claire + Will. Apparently, our one week experiment in beachfront living was a success because the following year Mom and Dad signed up for a one month stay in the height of the summer in a room that was on the first floor closer to the communal kitchen and toilet. I’ve often wondered what kind of vacation Mom had in Rockaway. She still had to cook and clean, keep tabs on her two kids, and do the wash, though we lived in our bathing suits practically around the clock. 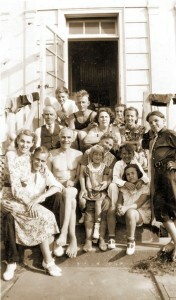 Our stays on the beach were a signal that our summer-long vacations at Grandma Hoppe’s house in Roxburg, NJ were over. No longer would Dad be driving there on Fridays after work in Manhattan to spend the weekend and then drive back on Monday morning. One benefit of this arrangement was that he got a lot of golf in during the midweek at the nearby Forest Park course and was able to improve his game considerably. After Mom and Dad got the Rockaway sand in their shoes, they were more and more committed to vacationing at the beach, though they continued to search for alternatives to Roxburg. One summer we stayed at Lake Osiris in upstate New York with the Trotte family. In another year it was a bungalow in Rockaway Point. But the call of the White House and the lifestyle that went with it was too strong to ignore. There were eight premium rooms and each had a porch facing the boardwalk and ocean. We contracted for one of them for eight weeks and promptly found that we had neighbors who were very sociable and loved to party. Lil and Harry Kamps and the Lanzillos came to be Mom and Dad’s year ’round friends. This entry was posted in Uncategorized on July 2, 2010 by will.